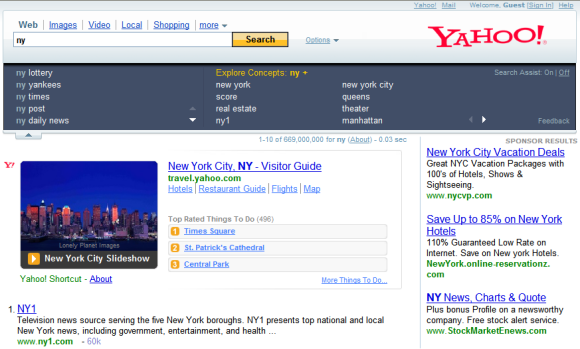 After last week's major update for Live Search (which is now live for everyone), Yahoo updated its search engine. Like Microsoft, "Yahoo said the upgrade was the most significant yet since it dumped Google's search technology in February 2004 in favor of its own," according to LA Times. Yahoo's search engine has less new things to show than Live Search. Yahoo introduced its own version of "universal search" by adding video previews and images from Flickr inside search results and by updating its impressive list of smart answers. 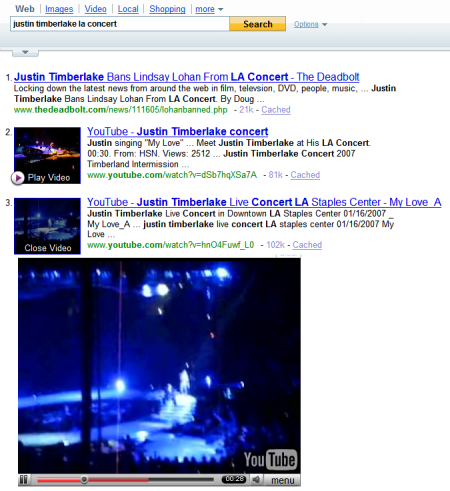 Yahoo shows embedded video players for results from YouTube, Metacafe, Yahoo Video. The new search assistant is somewhat similar to Google Suggest: it auto-completes your query. But unlike Google Suggest, it's supposed to show up only when you want to or when you need it. If you type some letters from a word and then stop for a couple of seconds, a new box opens and shows some suggestions. In the left side you'll see some popular ways to finish your query, while in the right side Yahoo expands your current query. You can select one of the suggestions or continue to type, while the list of suggestions updates. So this a combination between auto-complete and related searches, introduced for the first time by Ask.com. The only improvement made by Yahoo is that the assistant is not visible all the time. "Get rid of any of the so-called assistants. They take up space on the screen, slow down processes and insult everyone's [intelligence]." "The whole point is we want to get you from "to do" to "done." Whatever it is you want to do: research a topic, find a website, plan a vacation, research a medical condition, view a funny video, or any of the other billions of queries we get from users -- their intents expressed via a few keywords in a search box. One thing we've learned since launching our own algorithmic search engine back in 2004 is that at the end of the day, people really don't want to search; they want to get things done." Obviously, searching is just a mean and not an aim in itself. But sometimes the search, the path to your aim is more interesting than the end-result. That's why, search engines should make this process more intuitive and more appealing. All in all, it's clear that the most innovative search interface for this year was Ask 3D as it inspired many updates in Yahoo Search and Windows Live, while paving the way to mixing heterogeneous search results. very funny. If that guys is really so smart he won't really need to "search" anything. The problem is, if you accidentally roll the cursor over one of the suggestions it will replace what you have typed in the search box. Very frustrating to have to avoid the search assistant with the mouse, or start over on the search. So easy to fix! Just require a mouse click to transfer the suggested term into the search box. It would be just as fast and easy to use the other way. I can't stand objects that are triggered by cursor contact. Its a real time waster.